Canada Scott # 2194 issued Dec. 19, 2006 depicting flowers. Canada Scott #2238a issued Oct. 12, 2007 depicting Beneficial Insects. Canada Scott #2243 issued Dec. 27, 2007 depicting flowers. Canada Scott # 2106b issued Apr. 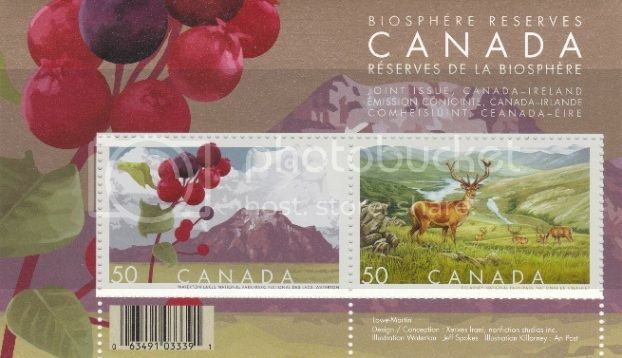 22, 2005 depicting biosphere reserves. Boy, some of those Canada ones are really spectacular! I particularly like the Astronomical ones (Nebulaie)! I knew that Canada had issued a number of S/S's in the past 20 years, but didn't realize so many. And they're all GREAT! Thanks MikeC99! Hoping there will be more! Anybody else with S/S's, please post them. I especially like seeing postally used ones, so post them even if they are used! Canada Scott #2327b issued Apr. 9, 2009 pertaining to Preserving the Polar Regions. Canada Scott #2276 issued June 20, 2008 pertaining to Anne of Green Gables. Canada Scott #2205b issued Feb. 12, 2007 celebrating International Polar Year. Canada Scott #2202 issued Jan. 5, 2007 celebrating Year of the Pig. Canada Scott #2229 issued Oct. 1, 2007 pertaining to Endangered Species. Canada Scott #2150 issued Apr. 21, 2006 celebrating the Queen's 80th birthday. Canada Scott #2110 issued May 27, 2005 depicting the art of Homer Watson. Canada Scott #2141 issued Jan. 6, 2006 depicting the Year of the Dog. Canada Scott #2148 issued Apr. 7, 2006 depicting the art of Dorothy Knowles. Canada Scott #2153 issued May 26, 2006 depicting famous Canadians in Hollywood. Canada Scott #2221 issued June 29, 2007 depicting famous Canadian Recording Artists. Canada Scott #2213 issued May 3, 2007 commemorating Ottawa's Sesquicentennial. Canada Scott #2219 issued June 22, 2007 celebrating 250th anniversary of Captain Vancouver's birth. Canada Scott #2260 issued Mar. 3, 2008 depicting Peonies.